Sara Kate Gillingham-Ryan is the founding editor of The Kitchn. She’s one of my food writing idols, and I feel honored to call her my friend, as well. 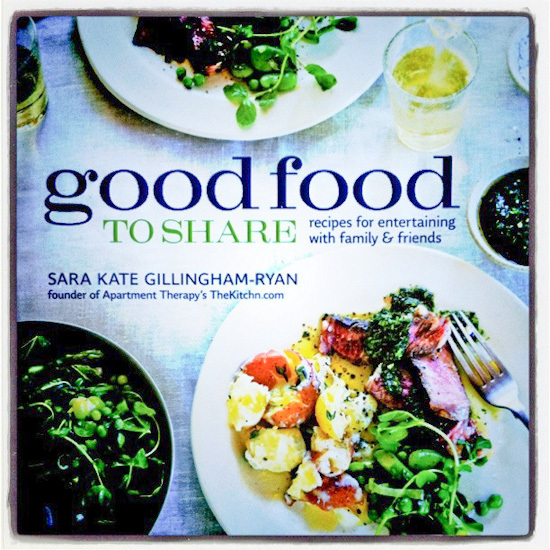 When Sara Kate offered to send me a copy of her new book Good Food to Share (Williams-Sonoma): Recipes for Entertaining with Family & Friends , I was thrilled. I own lots of cookbooks (I did a quick tally this morning and counted over 200, in fact), and love adding new titles to my collection. From the moment I cracked it open, however, I knew this wasn’t just another cookbook. Sara-Kate’s fun writing style and the numerous stunning photos by Ray Kachatorian grabbed me right away: I couldn’t wait to mix up one of the pretty cocktails and get cooking. Her recipes are simple, yet elegant, and so far I’ve tried the Short Ribs Braised in Balsamic, the Roasted Beet Salad, the Fattoush Salad, the Caramelized Cauliflower Steaks, the Roasted Broccoli with Red Pepper Flakes and Garlic, and the Grilled Steak with Charmoula. I found each one of them delicious and worthy of making many times over. Good Food to Share is more than just a terrific collection of recipes, though: the book is also filled with fantastic tips for stylish, but stress-free entertaining. I will freely admit that as much I like to cook, entertaining does not come easy to me. Now that I am armed with this treasure, however, instead of going into the upcoming holiday season with my typical angst, I simply can’t wait to have people over. Sara Kate gave me permission to share one of the recipes from the book with you, and I chose this Roasted Squash Salad with Dates and Spicy Pecans because it’s unbelievably delicious, and absolutely perfect for fall. I substituted butternut for the acorn squash (because I ended up with some beautiful ones growing out of my compost this year), and I didn’t have parchment paper so used additional olive oil when roasting the squash. I made no other changes to the recipe. Please know that even if you never get around to making this salad, it would be a huge mistake to never make these spicy pecans. Trust me on this, ok? They’re amazing. As Sara Kate writes in the book, this salad is the perfect accompaniment to roasted meats, pastas, or soups. It would also make a great light meal on its own, along with bread and a cheese plate. 1. Preheat the oven to 325 degrees F (165 degrees C). Line a rimmed baking sheet with parchment paper. Lightly coat the parchment with cooking spray. 2. In a medium bowl, stir together the sugar and 1/4 teaspoon salt. Set aside. 3. In a frying pan, warm 2 tablespoons of the honey over low heat. Add the cayenne and stir to mix well. Add the pecans and stir to coat. Spread the nuts in a single layer on the prepared baking sheet and toast in the oven until fragrant and lightly browned, about 10 minutes. Remove from the oven and let cool slightly, then add the nuts to the bowl with the sugar mixture, and toss to coat. 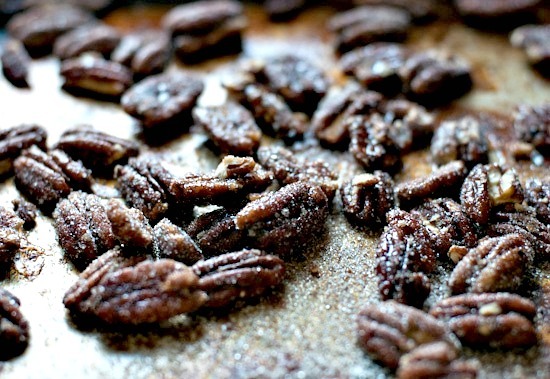 Discard the parchment paper and spread the pecans out in a single layer on the baking sheet to cool completely. 4. Raise the oven temperature to 450 degrees F (230 degrees C). Line a second rimmed baking sheet with parchment paper and coat generously with cooking spray. 5. Cut the squash in half lengthwise and scrape out the seeds. Cut the flesh crosswise into slices 1 inch (2.5 cm) thick. Pile the squash on the prepared baking sheet. Drizzle with 2 tablespoons of the olive oil, season with salt and pepper, and toss to coat. Spread the squash out in a single layer. Roast, turning several times, until fork-tender and lightly browned all over, about 25 minutes. Remove from the oven and cover with aluminum foil to keep warm. 6. In a bowl, whisk together the vinegar, mustard, and the remaining 2 tablespoons honey. Add the remaining 4 tablespoons (2 fl oz/60 ml) olive oil in a slow, steady stream, whisking constantly until a smooth, emulsified dressing forms. Season with salt and pepper. 7. Put the endive in a large salad bowl. Pour in the dressing and toss to coat thoroughly. Add the warm squash, the pecans, and the dates, and toss to combine. Serve right away. Combine the salad greens and shallots in a large bowl; sprinkle with 1/2 tsp. salt. Drizzle just enough of the dressing over the salad to coat lightly, and toss gently. 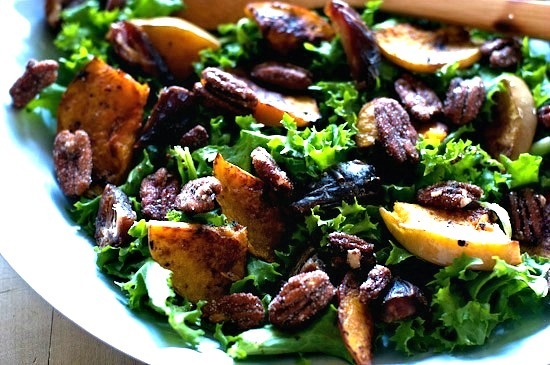 Divide the greens among six plates and scatter the pecans, squash, and pears over the greens. Drizzle with a little more dressing if desired and serve. Appears with permission from Good Food to Share . Recipes by Sara Kate Gillingham-Ryan; photographs by Ray Kachatorian. Copyright 2011 by Weldon Owen Inc. and Williams-Sonoma, Inc. I received this book in a giveaway. I adore it. I haven’t made that salad…but definitely will now! Definitely make the salad…and isn’t the book awesome?! Wow!! I have to say I am really a fan of your blog. Your recipes always look good. I can’t wait to do this salad that will surely please my entire family. Thanks! Winnie, what a lovely post and your photos are terrific. Looks like I need to order another book! Wow, you have done a great job of cooking your way through this book already. I am putting this on my wishlist for Christmas. What a beautiful salad this is and your photos make it really shine, Winnie. Winnie! I’m so honored to be on Healthy Green Kitchen. Thank you for such a beautiful tribute to my squash salad! This salad sounds awesome! Thanks for sharing about Sara Kate’s cookbook! What a gorgeous salad… Love the recipe and all of your photos. What a fantastic way to make salads interesting again. I can always use new salad inspiration! Looks wonderful – the perfect combination of flavours and textures for a good salad! Definitely will find time to make it in the coming weeks! What a lovely salad. I love how the bitter of the greens is balanced by the sweetness of the dates and squash and complimented with the spice of the nuts. Gorgeous! I love this combination of flavors. Thanks for the suggestion. I’ll have to check out her book! Fabulous – what a great salat. this looks great. i think i will make it this weekend! 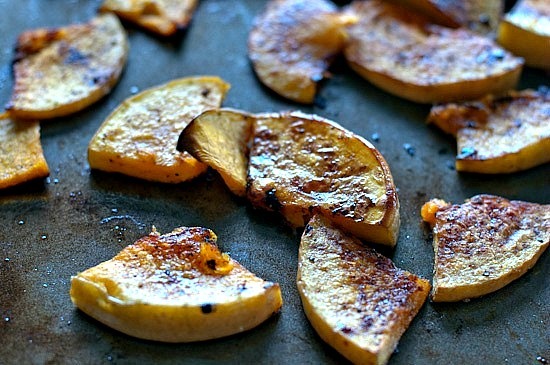 did you peel the acorn squash before roasting? Love this salad. Perfect for autumn. Looks like a really great book that I might have to add to my collections. The pictures in this post are incredible! I’m extremely excited to try this recipe! I just at stuffed squash for lunch but I’m totally in the mood for this salad now! YUM! What a wonderful fall salad, and very impressive. I have butternut squash waiting on the counter to be put to good use – I’ll replace the acorn squash with it. I’ll bet it’s just as good. 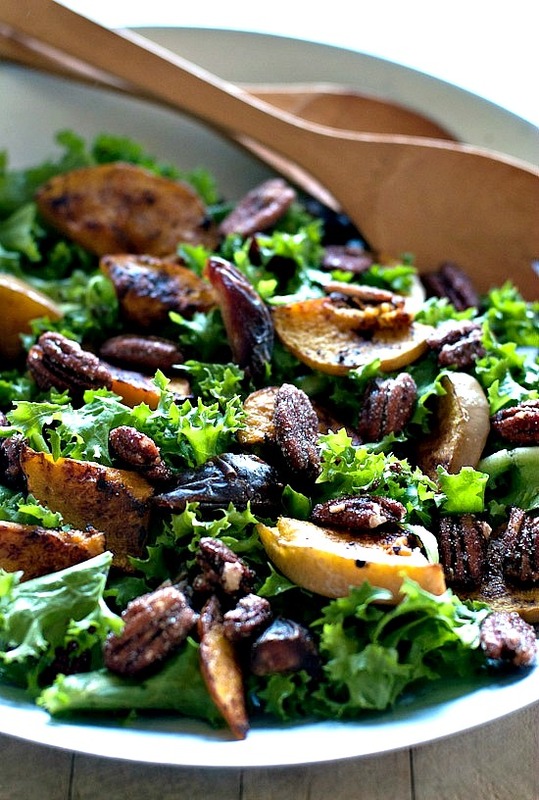 I can only imagine the wonderful flavour that these spicy pecans give to this beautiful salad. So wonderful of you to make this for us and for Sara Kate to allow you to publish the recipe. I’m sure many of us are anxious to have her book in our collections! This looks just wonderful! I can’t eat pecans, but this looks like it would be delicious anyway. Thanks for posting this!